When most people hear the term notary, a notary public comes to mind. A notary public is someone who witnesses the signing of legal documents and administers oaths. While a notary public performs important tasks, notary publics are not required to have legal training and are not granted legal powers. A 1998 amendment to Florida Statute Sec. 118.10 modified and clarified the powers of a Florida International Notary and renamed the appointment of a civil law notary. Civil Law Notaries are referred to as notarios, notaries, and notariats in other countries. Civil Law Notaries can only be appointed after passing the bar, have a minimum of five years of legal practice, must undergo extensive training, and pass a rigorous state exam. Appointed for life by the secretary of state, Florida civil law notaries have the same powers that notaries that countries with civil law traditions have. With only 120 lawyers in Florida being civil law notaries, we are proud to announce that Paul J. Burkart has been appointed a Civil Law Notary in Florida. Paul J. Burkhart has received this honor for being the cream of the crop in his civil law jurisdiction. Draft legal instruments reflecting the desires of the parties with applicable legal requirements to ensure the tool is legally enforceable. Represent the transaction and act as an intermediary for multiple-party transactions. Equally, impartially, and accurately advise the parties about the legal consequences of the transaction or instrument. Supervise the execution of a power of attorney. Oversee the execution of a deed or real estate to be transported to a foreign jurisdiction. Facilitate the transfer of probate from a foreign country to Florida. Can offer expert testimony to a Florida court concerning the legality of documents from a civil-law country. Prepare documents for residents and business owners to use and to be accepted in civil law countries. Certify the existence and authenticity of private records, such as; school transcripts, insurance, and financial documents. Pension Claimants – Provide authority for the payment of benefits to Florida residents receiving monthly benefits from foreign governments. Marriage Ceremonies – Can perform wedding within Florida and upon the High Seas. World Records – Supervise and attest to completion of acts or events accepted by the Guinness World Records. Paul J. Burkhart is a Civil Law Notary in the state of Florida. 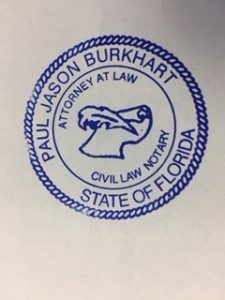 If you have any questions, or if you or someone you know might benefit from Paul’s services as a Civil Law Notary, please contact the Law Office of Paul J. Burkhart at 561-880-0155 or email him at paul@paulburkhart.net.